I made it in to two stores today and saw the newest items to hit the shelves. 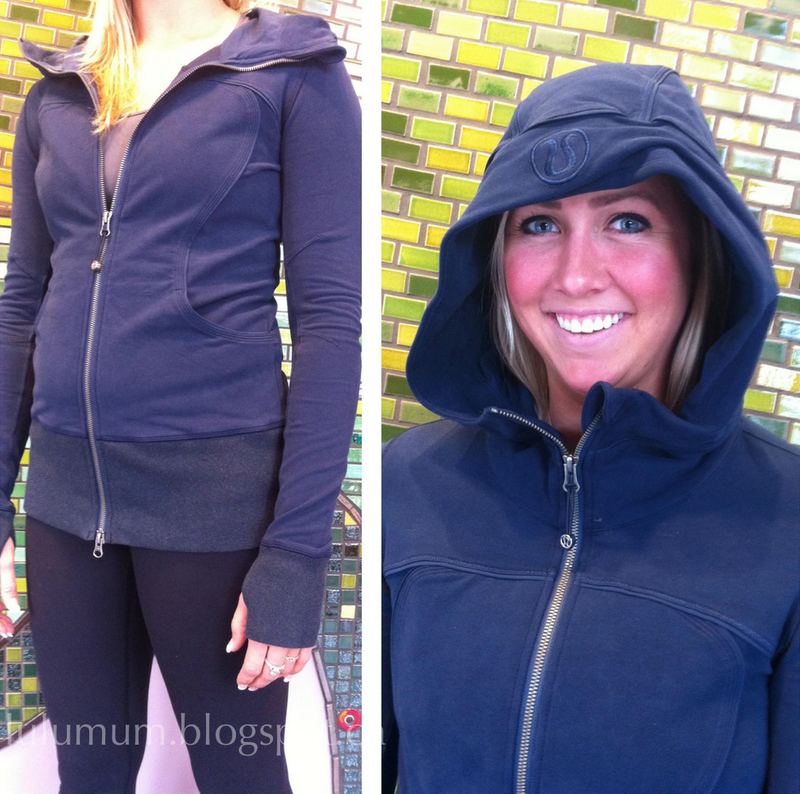 Live Simply II Jackets are in in Black, Cornflower/Inkwell and Inkwell. They are slightly different from the older version, this one is longer in length and also the cotton french terry is quite a bit thinner. Its definitely soft, but I didn’t feel tempted by them. I have a Sing Floss Travel Jacket in Navy which I love, and the new Harmonious Hoodie in Cornflower which I thought was way more special than the Cornflower Live Simply. Not that I didn’t like it, I just thought it was that much more wintery and special. I also saw the Pretty Pink Slalom Striped CRB which felt almost as soft as RULU. The fabric content of the CRB is 92%Nylon8%Lycra Spandex while my RULU vinyasa is 91%Nylon/9%Lycra Spandex – fairly similar but the RULU vinyasa is thicker. If you are only vaguely interested in the color, the tactile feel of this CRB may tempt you. I also saw the Green Bean CRB and that one was a must buy for me. Not as soft as Pretty Pink but it also is 92%Nylon/8% Spandex. I think the dyes can effect the softness of luon and since the Green Bean is such a saturated color, it feels more like my Plum Cool Racerback and my Pigment Blue CRB. Their were also some other Cotton French Terry items in store that I was really not interested in. The Avenue Pullover in Green Bean/Inkwell Hyperstripe was not pretty at all – it reminded me of Caillou’s special sweater. 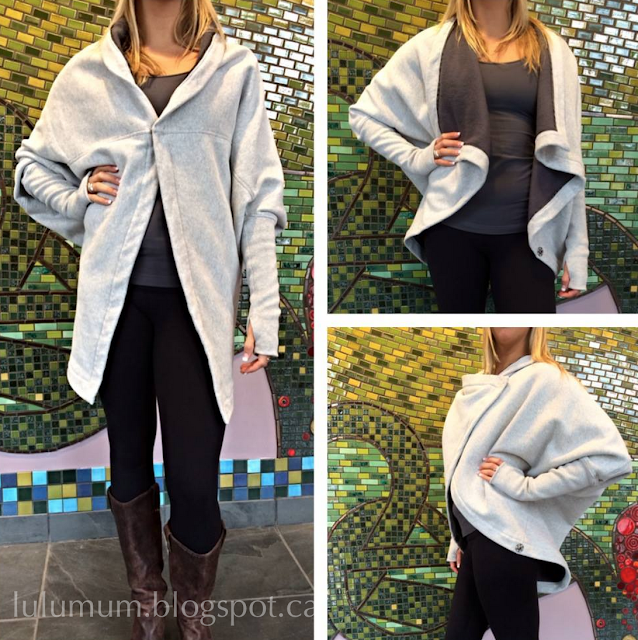 The It Makes Two Wrap is really thick cotton french terry with fleece inside. 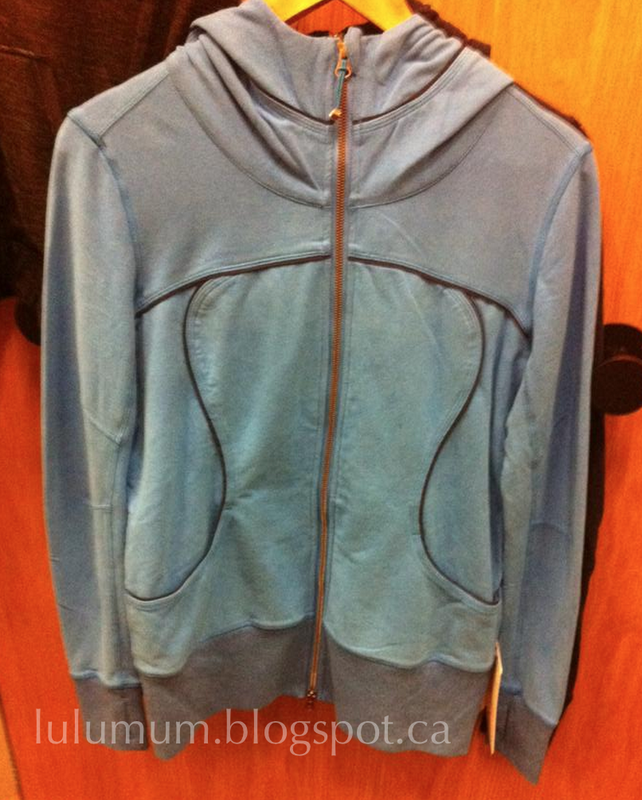 It just looked bulky and sweatshirty, not very chic. No Forme II Jackets in today in either Pique or Herringbone. Those are what I’m after in tonights upload. I remain in love with the Harmonious Hoodie.